Sources revealed new details on the events leading up to the murder-suicide in Radnor Township back on April 23. It was the deadly love triangle that shocked the Main Line. A woman used a tracking device to watch her cheating husband's every move -- then disguised herself before killing his mistress and then herself. NBC10 has new details about the timeline of this shocking April murder-suicide. A distraught wife underwent weapons training and used a tracking device on her husband before killing his mistress and then taking her own life inside a home in Philadelphia's wealthy Main Line, according to sources close to the investigation. 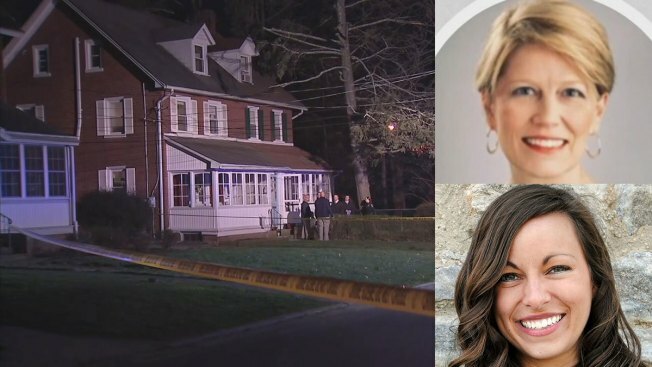 The sources revealed new details on the events leading up to the suburban murder-suicide in Radnor Township on April 23, including that the husband was texted grisly photos from the crime scene. Jennair Gerardot shot and killed Meredith Sullivan Chapman, 30, inside her home before turning the gun on herself. Chapman had been having an affair with Gerardot's husband, Mark Gerardot, prior to the shooting, police said. Chapman was a former WHYY producer for its Delaware bureau and ran an unsuccessful bid as a Republican for a state senate seat in Delaware. She was also married to Newark City Councilman Luke Chapman, but the couple was reportedly separated. She had recently moved to the home on Lowrys Lane in Radnor Township for a new job at nearby Villanova University. Gerardot's life had also changed prior to her death. A recent transplant to the East Coast, her social media photos with her husband Mark showed a seemingly happy couple. But underneath the surface there were signs of trouble. "There were money issues, self-confidence issues," Radnor Township Police Superintendent William Colarulo said. "Her life was falling apart." Gerardot began posting messages on social media begging for help while claiming her marriage was crumbling and her husband wanted out. She was also searching for therapy. Sources told NBC10 Gerardot began using a tracking device and computer software to find out more about her husband's affair with Chapman. On April 21, Chapman's neighbor saw a woman with a "grim, concerned or worried" expression on her face standing near her driveway in Radnor Township, police said. The woman was using a pair of binoculars while staring at Chapman's home on Lowrys Lane. The neighbor said the woman then got into a black SUV and drove off. Despite thinking the episode odd, the neighbor decided not to report it to police. Law enforcement sources believe the mysterious woman was Gerardot, who was driving a rental SUV and using binoculars to scout out the area. Two days later, Mark Gerardot arrived at a restaurant in Newtown Square where his wife had told him to meet her for dinner. Only six miles away, Jennair Gerardot was near Chapman's home, parked in the back inside the rented SUV with gloves and earplugs. She then broke through the front porch door and waited for Chapman to return, having just enough time to clean up the broken glass, sources say. When Chapman walked into the home, Gerardot opened fire, killing her, before taking her own life, police said. Gerardot underwent gun training before purchasing the murder weapon, sources said. While carrying out the killing, she fired so fast that Chapman, who was still clutching her house keys, likely didn't see it coming. Around 7 p.m. that night, Mark Gerardot began receiving text messages from his wife while he waited at the restaurant. The messages included graphic photographs from inside Chapman's home. Mark Geradot then rushed to Chapman's house where he found both his lover and his wife dead from gunshot wounds. Mark Gerardot called 911 and was so hysterical that he gave the wrong house number. He also confessed to the dispatcher that he'd been cheating on his wife, sources said. Investigators also found an extensive suicide note from Jennair Gerardot. Since the murder-suicide, neither Mark Gerardot nor Chapman's ex-husband have publicly commented on the case. With the case closed, police may not ever release everything they've learned and some questions may always remain unanswered. Chapman's family called her a "beacon of light to anyone who was fortunate enough to meet her," in a released statement. "She loved her family fiercely, was a compassionate friend and among the most talented and innovative professionals in her field," they wrote. "Her death was sudden and tragic, but will not define who she was to the thousands of people who loved her."